If you're looking for a cruise travel franchise, put Cruise Planners & American Express to work for you! Joining Cruise Planners is like adding 45 people to your home office staff! History Cruise Planners has a tremendous reputation for quality, service, and very competitive pricing. Due to our high sales volume, our buying power enables us to offer you the opportunity to cruise in style at the lowest prices available, while still receiving the best service in the cruise business. Buying travel over the Internet can be a bit mysterious - we'd like to put your concerns at ease. Cruise Planners is a licensed, bonded, and insured agency. We are members of CLIA (Cruise Line International Association), NACOA (National Association Of Cruise Only Agencies), and ASTA (American Society of Travel Agents. Congratulations! You have just taken the first step toward an exciting and fulfilling career as your own boss. Cruising has been the fastest growing segment of the travel industry for over 22 years, and it is still booming! If you want to get into the cruise and travel business, put Cruise Planners & American Express to work for you! 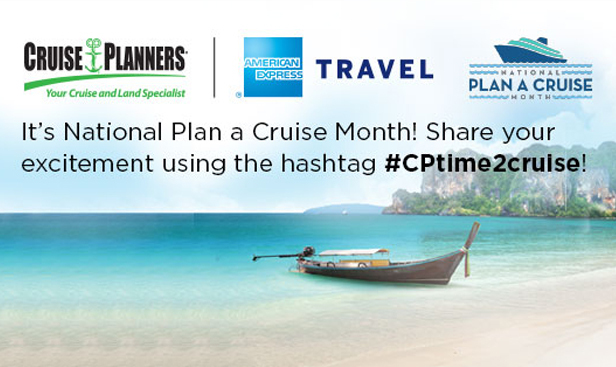 Cruise Planners is an American Express Travel Representative. Joining Cruise Planners is like adding 45 people to your home office staff! We offer you a support team for marketing & advertising, technology, sales, training and much more. & Services - Become part of a national company – in business for over 14 years. - No experience necessary – we teach you everything about the cruise/travel business. - Comprehensive 5-day training program in Fort Lauderdale, FL. - Highest commissions in the industry. - No territories - you can market almost everywhere. - Huge range of marketing and advertising tools provided to you, including a dedicated website, your own customized consumer magazine and lead generation programs. - Cruise Planners proprietary business management software gives you control of your business. - Access to group rates and preferred pricing with special amenities through volume bookings. - Secured client list - your clients belong to you. - Exclusive Cruise Planners bonus program. - You cruise at reduced travel industry rates. Ranked #1 in Cruise Only Franchises by Entrepreneur magazine 2004, 2005, 2006, 2007 & 2008 in the annual franchise 500 issue. Financing Assistance: Yes, through a third party. etc. Cruise Planners' franchisees pride themselves on professional, resourceful, helpful customer service. This all begins with our Home Office staff. Our staff is dedicated to your success, and we are here to help you with everything, from marketing your business to entering a booking in your software to any sales or accounting issue that may arise. We never forget that your success is our success. We know too that your training and professional development are essential to your success in the cruise industry. The best opportunities in travel today are in selling cruises. Cruise Planners is a proven leader in the industry. Cruise Planners' business and cruise training begins with five days in Ft.
Lauderdale, Florida, which is right in the heart of the cruise industry. Every aspect of the cruise travel business, from reservation and operational procedures to creating successful cruise events and cruise ship inspections is covered in detail. Contact CP Franchising, LLC. dba Cruise Planners. Address 3300 University Drive Suite 652-602.